Just want to play my game without reading this whole post? 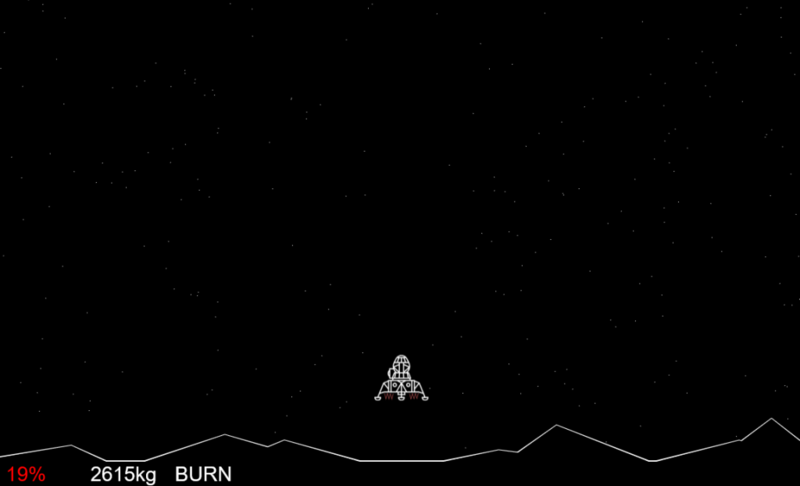 Play the game here – press a key, mouse button, or touch the screen to fire the thrusters, and try to land at less than 4 m/s with as much fuel left over as possible. In 1969, when all the nerds were still excited by sending humans to the moon instead of flinging cars around the sun, the hottest video game was Rocket (or Lunar) for the PDP-8. 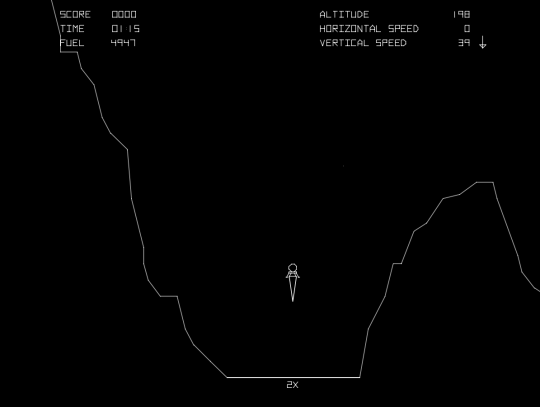 Originally implemented in FOCAL by high school student Jim Storer and soon afterwards ported to BASIC (the other dominant language to come as standard with microcomputers), Rocket became the precursor to an entire genre of video games called “Lunar Lander games“. Like many pieces of microcomputer software of the time, Rocket was distributed as printed source code that you’d need to carefully type in at the other end. 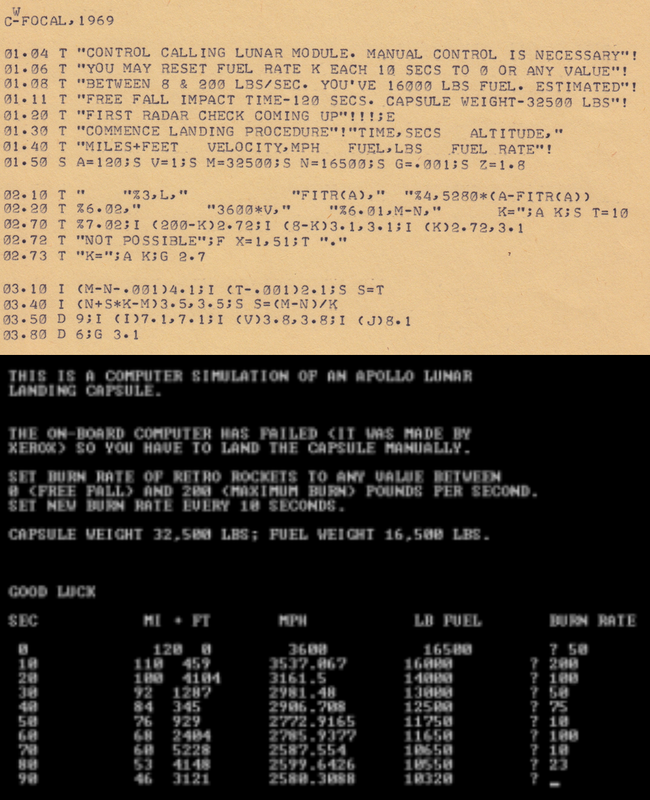 The aim of these games was to land a spacecraft on the moon or similar body by controlling the thrust (and in some advanced versions, the rotation) of the engine. The spacecraft begins in freefall towards the surface and will accelerate under gravity: this can be counteracted with thrust, but engaging the engine burns through the player’s limited supply of fuel. Furthermore, using fuel lowers the total mass of the vessel (a large proportion of the mass of the Apollo landers was fuel for use in the descent stage) which reduces its inertia, giving the engine more “kick” which must be compensated for during the critical final stages. It sounds dry and maths-y, but I promise that graphical versions can usually be played entirely “by eye”. Atari’s 1979 adaptation is perhaps the classic version you’d recognise, although its release was somewhat overshadowed by their other vector-graphics space-themed release in 1979: Asteroids. Let’s fast-forward a little. In 1997 I enrolled to do my A-levels at what was then called Preston College, where my Computing tutor was a chap called Kevin Geldard: you can see him at 49 seconds into this hilariously low-fi video which I guess must have been originally shot on VHS despite being uploaded to YouTube in 2009. 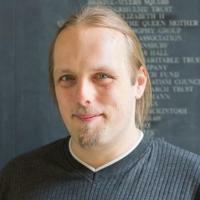 He’s an interesting chap in his own right whose contributions to my career in computing deserve their own blog post, but for the time being all you need to know is that he was the kind of geek who, like me, writes software “for fun” more often than not. Kevin owned a Psion 3 palmtop – part of a series of devices with which I also have a long history and interest – and he taught himself to program OPL by reimplementing a favourite game of his younger years on it: his take on the classic mid-70s-style graphical Lunar Lander. 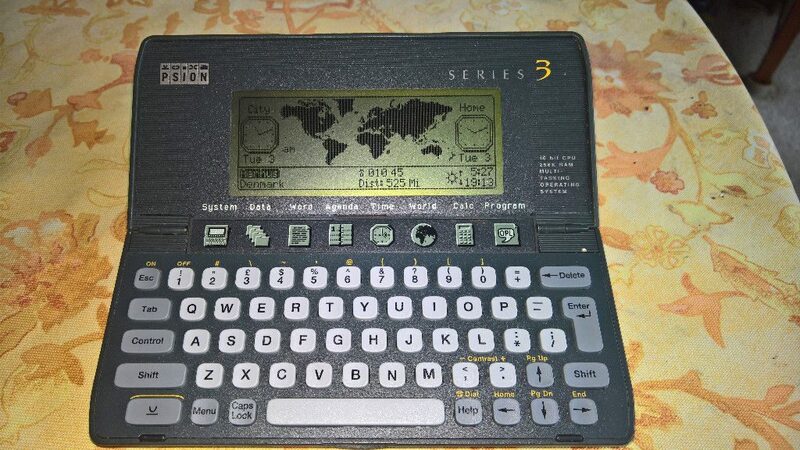 I never owned a Psion Series 3 (pictured), but I bought a Series 5mx in early 2000 out of my second student loan cheque, ultimately wrote most of my undergraduate dissertation using it, and eventually sold it to a collector in about 2009 for almost as much as I originally paid for it. The 5mx was an amazing bit of kit. But I’ll blog about that another day, I guess. My A-level computing class consisted of a competitive group of geeky lads, and we made sort-of a personal extracurricular challenge to ourselves of re-implementing Kevin’s take on Lunar Lander using Turbo Pascal, the primary language in which our class was taught. Many hours out-of-class were spent in the computer lab, tweaking and comparing our various implementations (with only ocassional breaks to play Spacy, CivNet, or my adaptation of LORD2): later, some of us would extend our competition by going on to re-re-implement in Delphi, Visual Basic, or Java, or by adding additional levels relating to orbital rendezvous or landing on other planetary bodies. I was quite proud of mine at the time: it was highly-playable, fun, and – at least on your first few goes – moderately challenging. I sometimes wonder what it would have looked like if I’d have implemented my 1997 Lunar Lander today. So I did. You can have a go at my game right here in your web browser! 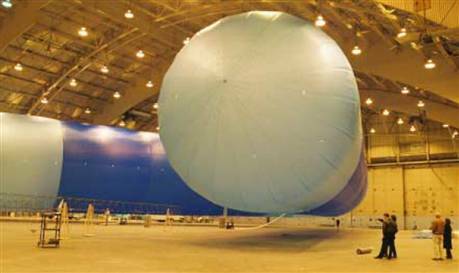 The aim is to reach the ground travelling at a velocity of no more than 4 m/s with the maximum amount of fuel left over: this, if anything, is your “score”. My record is 52% of fuel remaining, but honestly anything in the 40%+ range is very good. Touch the screen (if it’s a touchscreen) or press a mouse button or any key to engage your thrusters and slow your descent. “Houston, the Eagle has landed.” Kerbal Space Program, it isn’t. 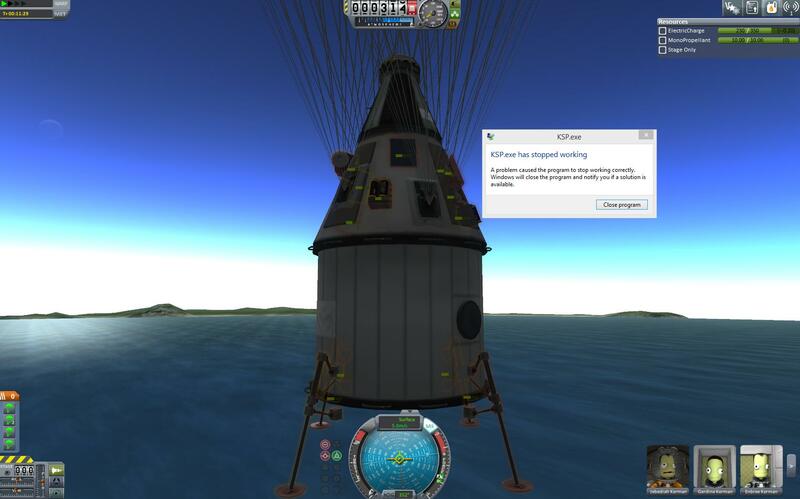 Here’s a very good landing: 3 m/s with 48% of the fuel tank remaining. And of course it’s all open-source, so you’re more than welcome to take it, rip it apart, learn from it, or make something better out of it. This link was originally posted to /r/KerbalSpaceProgram. See more things from Dan's Reddit account. Hey, mods: how about a Lanius flair? This self-post was originally posted to /r/ftlgame. See more things from Dan's Reddit account. 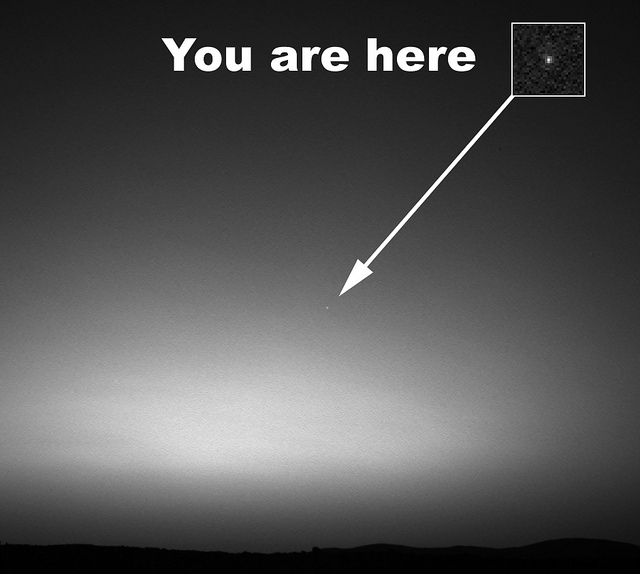 Proxima Centauri is 4.3 light years way: too far to travel. Why don’t we just use Mercury (which has an 88 day year) as a staging ground, and launch from there? This self-post was originally posted to /r/shittyaskscience. See more things from Dan's Reddit account. Mercury’s year is only 88 days, so if we launch a rocket from there, we only have to travel for just over 1 light year, saving time and fuel.